Hide from the enemy with Blitz Gundam's Mirage Colloid cloaking. 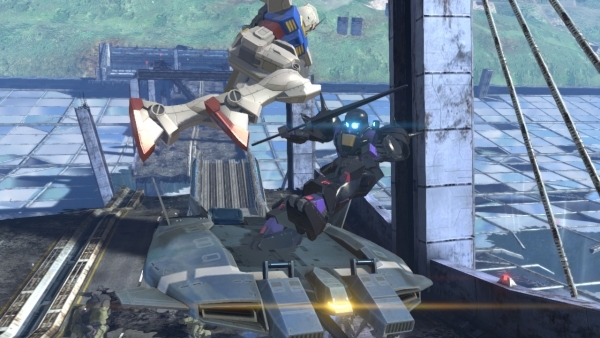 Famitsu this week confirms new Gunpla playable in the upcoming Gundam Breaker 2 for PlayStation 3 and PS Vita. From Gundam Seed comes Duel Gundam and Blitz Gundam. The former is described as highly versatile, with all of its parts usable across the board, while the latter can use the Mirage Colloid cloaking system to disappear from the enemy. Outside of new Gundam, the magazine introduces a number of firearm weapons, including the rifle, double rifle, machine gun, long rifle, Gatling gun, and bazooka. Gundam Breaker 2 is due out on December 18 in Japan.